I am really enjoying the hands on nature of the work while bringing something more to the job through my previous experience as a chief engineer. Dunne first learnt about the organisation Mercy Ships 20 years ago through an article in a marine engineering journal. “As a marine engineer, I had always felt the call to serve in a voluntary capacity but hadn’t realised where I could do so,” he said. years, the navy kept giving him jobs he enjoyed so his service extended to 23 years. “It was a great career and gave me some fantastic training, experiences and job satisfaction. However, although I had been the marine engineer officer of three HMA ships (Moresby, Darwin and Manoora), my qualifications and experience were not recognised by the Australian Maritime Safety Authority (AMSA),” Dunne said. Consequently, he was obliged to conduct some bridging training in the UK and obtained his third engineer’s qualification through the Maritime and Coastguard Agency. Dunne came to realise that working at sea was also difficult for him as a father and husband. “I really enjoy marine engineering but the downside is that it takes you away from your family for long periods. With three young sons this was a real drawback to continuing my seagoing career. 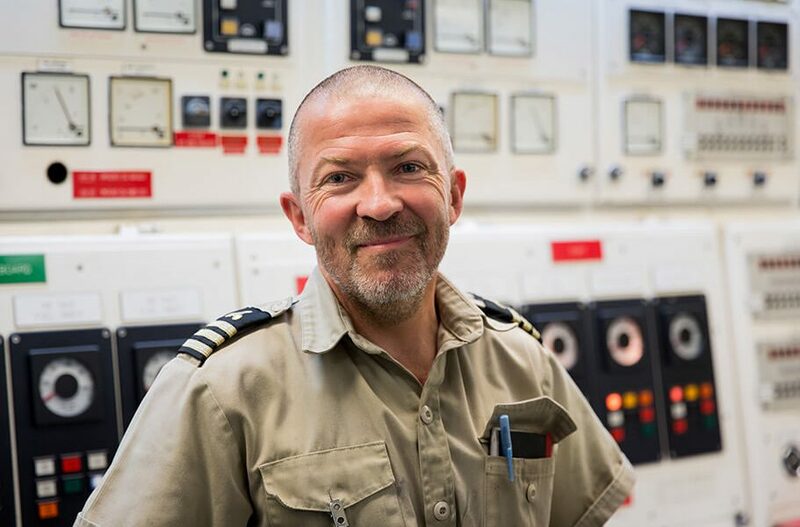 The beauty of serving with Mercy Ships is that I can contribute my skills and experience to such a great mission and do so with my family,” he said. What began as an opportunity to serve some of Africa’s most needy people has become a big adventure for the Dunnes. They have swapped their life in Newington in western Sydney for a two year commitment aboard. Like all 400 crewmembers, they are unpaid volunteers and actually pay crew fees to cover their accommodation and food costs. After acceptance by Mercy Ships, Dunne and his wife Tammy left their jobs, sold their car, rented out the family home and undertook a six week introductory course in Texas. They then joined the Africa Mercy in Tenerife prior to its departure for the Republic of the Congo. The Dunne’s decision has had a profound impact on their lives. “It has made us evaluate what we need as opposed to what we want. It has made us be more deliberate in the decisions we make as a family,” Dunne said. “We have been fortunate to have donations towards our costs from family and friends. My former company, Capability Partners, paid for some training and our local medical practice gave us a discount on our seagoing medicals. “At this stage, our funding and savings will almost cover our initial commitment to serve but should we decide to stay longer we will need to raise more financial support,” Dunne said. is donated – so I want to make sure that we spend it as effectively as possible,” Dunne said. will all have been totally worth it.” The Dunnes maintain a blog where they record some of their experiences. I’d like to receive the Cargo Day 2017 newsletter via email.